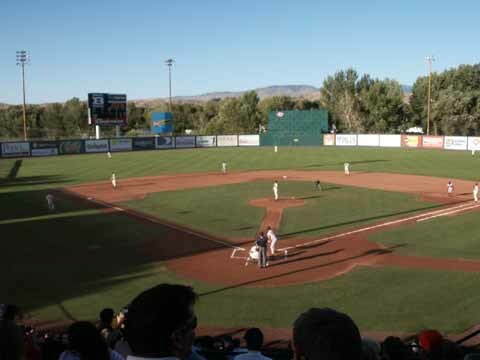 The Boise Hawks, a Single A affiliate of the Chicago Cubs, play at Memorial Stadium, which was built in 1989, seating 3,426. 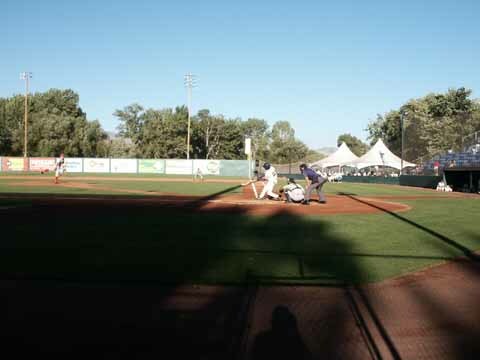 They were playing the Spokane Indians. 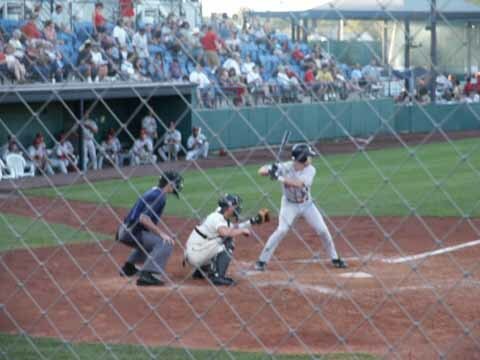 In the afternoon when we went out to the field to get our tickets we followed the Spokane team bus to the field. Andrea watched the players get off the bus talking on their cellphones and carrying their drink bottles. 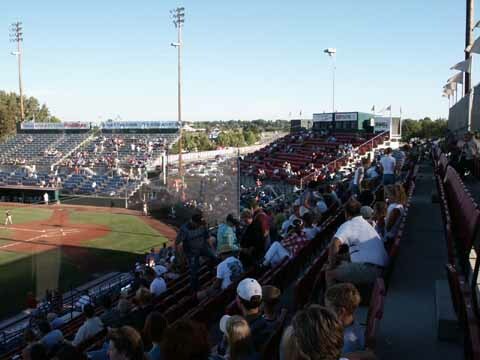 The stadium is adjacent to the Western Idaho Fairgrounds and was built in 1989. 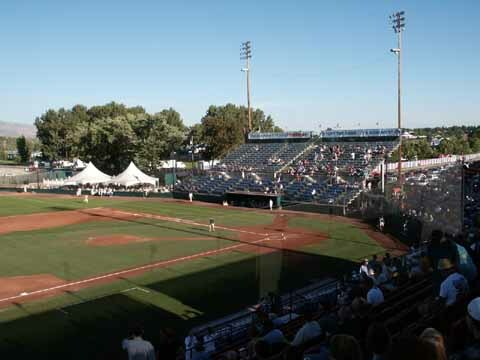 The stands are in three sections with mostly seats, except for bleachers in the upper section on the first base side. 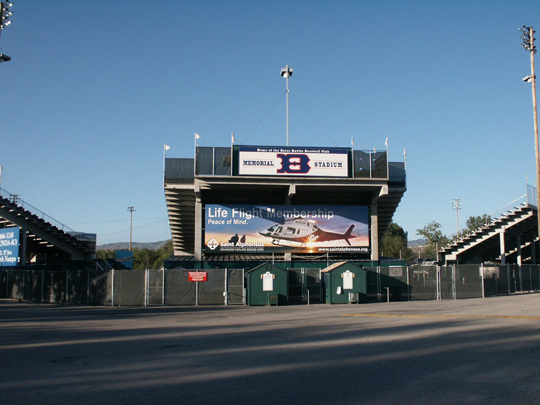 The stadium is Memorial Stadium, built as a memorial to deceased veterans of WW II and later conflicts. 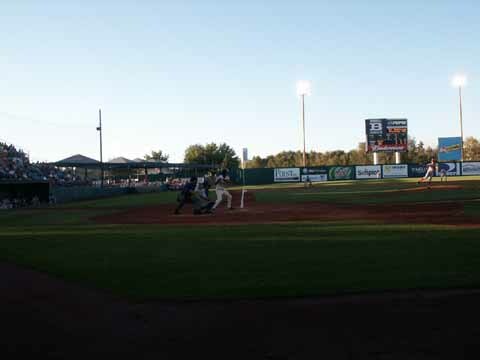 The field is Bill Campbell Field. 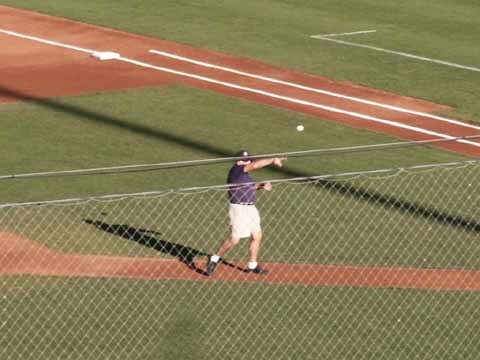 Harmon Killabrew, who is from Payette ID, threw out the first pitch. Jim was in the far corner of the stands when this happened, so the pictures are rather distant. Harmon had an autograph signing session before the game, but was continuing to sign autographs in the party tent after the game started. 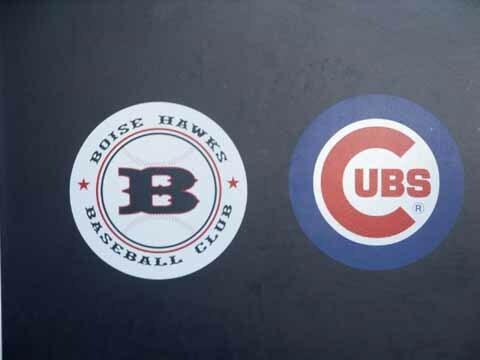 Jim bought a Boise Hawk logo baseball and went to get an autograph. Harmon was walking behind the stands when Jim saw him and asked and received the autograph on the ball. 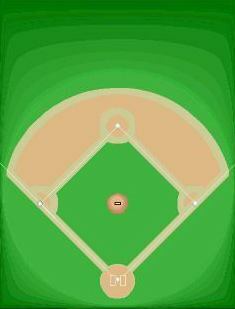 Harmon played for the Washington Senators 1954-1960, Minnesotta Twins 1961-74, and Kansas City Royals 1975. He is 5th on the Home Run List with 573 and second in the American League behind Babe Ruth. 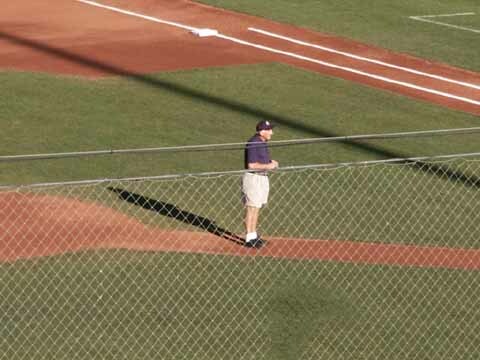 He is in the Baseball Hall of Fame. 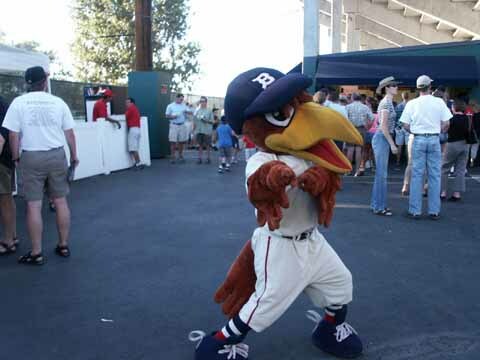 Humphrey the Hawk is the mascot. 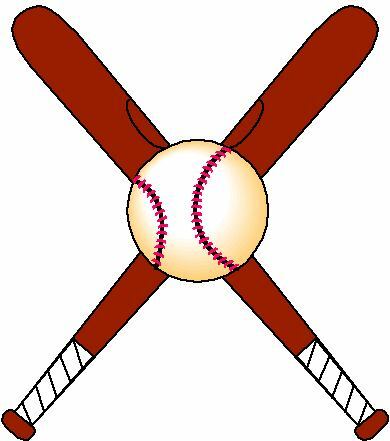 Monday is $1 hot dogs and Tuesday is $1 beer and soda, 10 oz. Attendance was 3,208. The field lines are RF-335', CF- 400', LF-335'. 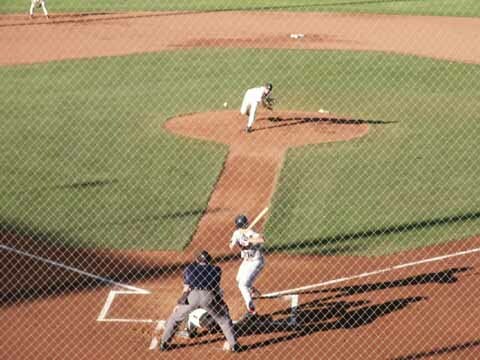 The Hawks beat up on Spokane 10-3. 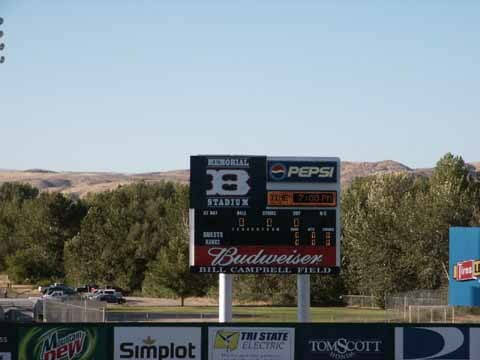 The box score was Spokane R-3, H-6, E-2, Hawks R-10, H-13, E-4. New Logo. Old Idaho Penitentiary State Historic Site - was used 1870-1973 as a territorial prison and as Idaho's only state penitentiary. The grounds and a rose garden are maintained as they were by the inmates in the early 1900s, Fee. World Center for Birds of Prey - 7,200 square-foot interpretive center features exhibits about birds of prey, biology, ecology and conservation as well as a tropical forest, Fee.